There are numerous local pubs, restaurants, tea shops, cafes, fish and chips shops etc both locally and beyond. Below we’ve recommended a few that we enjoy going to and some that we’ve yet to visit but that our friends tell us are great. Please do let us know if you come across a gem that isn’t listed below and we’ll add them to the list. A great local pub, which recently won the CAMRA pub of the year. Great real ales and the best pub food in Sheringham - all with a Greek twist! Lots of dog friendly outside space. One of our favourites. One of our favourites for breakfast -great coffee, bacon rolls and views of the sea. Have a look around the rummage room – we always come out with something interesting! Food served all day and very dog friendly. Open from 7am in the summer months. A bit of a local treasure – great food and service and an ever changing menu. The bread and butter pudding is to die for. Booking recommended. An interesting conversion of an old bank into a Nepalese restaurant that also serves British cuisine. The curries are good as are the Sunday lunches. A fabulous local restaurant with an ever changing menu and beautiful atmosphere, particularly in the evening. Be warned – you definitely need to book. 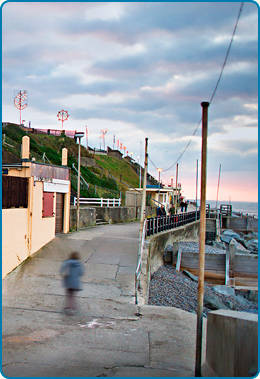 Our favourite fish and chip shop in Sheringham – it’s the one all the locals go to. A beautiful country house hotel owned by our good friends Don and Lindsay. The hotel has won UK Best Small Hotel of the Year on numerous occasions. The restaurant, open for Dinner and Sunday lunch, offers a fabulous three-course set menu with all food sourced within 10 miles of North Walsham. The bar & hotel is dog friendly. Booking essential. A delightful spot on the edge of Pretty Corner gardens, with lots of outside space. Always has interesting specials, soups and great cakes. Fabulous well renowned Gastro Pub in a beautiful village. The loos are reputed to have cost £1 million! You can often play spot the celebrity in here – both Stephen Fry and Amanda Holden have houses in the village. Very dog friendly. A buzzy, always busy restaurant, cafe and deli in the centre of Holt serving locally sourced fare. The Norfolk Dining Pub of the Year 2011 in a beautiful setting and gardens just outside of Holt. They’ve recently installed a wood burning pizza oven in the garden bar and serve pizza from 1pm – 8pm daily in the summer. Very child friendly, there is a willow maze, a play castle and a climbing frame in the garden. Dog friendly. Not a restaurant and you can’t eat here. However, a great place to buy stuff to have a picnic either in or out of the house! They source and make fabulous pies, cakes, bread, olives and cheeses as well as selling locally produced organic wines, pickles and much, much more. They’ll also give you the recipes for the cakes they produce!